The Single Father's Guide: Acknowledgements for SEASONS OF HOPE: Thank You! Acknowledgements for SEASONS OF HOPE: Thank You! For my single father brothers out there, the Seasons of Hope 2016 Calendar is a project that I created with a dear friend to build a greater awareness of breast cancer risk factors, foster prevention, and inspire hope to the women and families who are fresh to or from the battle. The project is very important to me; my wife and the mother of my three beautiful children succumbed to the disease. If you want a great, functional 2016 wall calendar including breathtaking images and heartrending biographies of 12 women who have faced breast cancer diagnosis, please click the link, below, and order a few for you, your friends, and heck, everyone you know. Thanks. To the twelve inspirational Seasons of Hope 2016 Calendar ladies, thank you. Through the images and the words we’ve used to describe your dauntlessness, we hope we’ve at least come close to representing the faith and optimism you exhibited during your respective journeys. 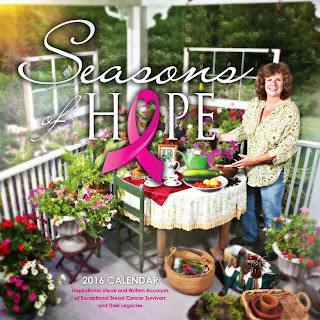 The objectives for the Seasons of Hope 2016 Calendar are not only to improve breast cancer awareness and prevention, but also to provide a source of hope for those women who are fresh to or fresh from the breast cancer battle. Your involvement has ensured success. In your honor, a meaningful portion of the proceeds from the Seasons of Hope 2016 Calendar will be used to help the families, specifically the children, of women who battle or have battled breast cancer. Setting up for Lori Marrie's "Black Dirt" shoot; Kathie on top of the world! Several other people have also been influential in the creation of the Seasons of Hope 2016 Calendar, including owner of Style Counsel Clothing of Warwick, New York, Tim Mullally, whose Pink Friday event was in part the inspiration for the Seasons of Hope 2016 Calendar. Linda Myers and everyone at Goshen Historic Track; Jody Riedel for the use of her Standardbred Pacer, Dream Luck; Blake Hargrave for the use of her classic Ford Mustang, providing the backdrop and props for Christina Rowan’s “Mustang” shoot; Sunrise House in Lafayette, New Jersey, for Kelly Della Rosa’s “Blur” shoot; our friends at Sheuermann Farms in Warwick, New York, for the setting of Lori Marrie’s “Black Dirt” shoot, and Brian Dering, for helping to recreate Bird Island on the Jersey Shore for his wife’s “Kindred Spirits” shoot, thank you! In addition, thanks to Gary Kessler, who donated his editing skills to help guarantee that our message is as clear as it can be. Of course, we genuinely appreciate the support from the families and friends of our Seasons of Hope 2016 Calendar ladies. Finally, to our own families, including Jordan, Katie, William, Lorraine, Wade, Emma, and Jack, we love you! Thanks for your patience and understanding while we worked to create what we hope will be an enduring and important contribution to creating breast cancer awareness, prevention, and hope.